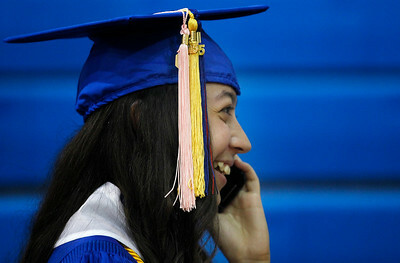 Matthew Apgar - mapgar@shawmedia.com Gloria Kranenburg of Woodstock, 18, laughs as she makes a call on her phone prior to their commencement ceremony on Friday, May 29, 2015 at Marian Central Catholic High School in Woodstock. 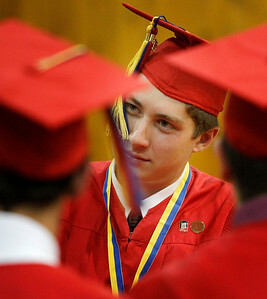 Matthew Apgar - mapgar@shawmedia.com Gavin Digangi, 9, entertains himself in the bleachers as his sister, Delayne Digangi, 18, both of Crystal Lake, has her photo taken with numerous friends before their commencement ceremony on Friday, May 29, 2015 at Marian Central Catholic High School in Woodstock. 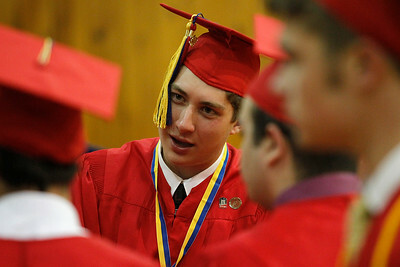 Matthew Apgar - mapgar@shawmedia.com Hans Varga, center, spends time with friends before their commencement ceremony on Friday, May 29, 2015 at Marian Central Catholic High School in Woodstock. 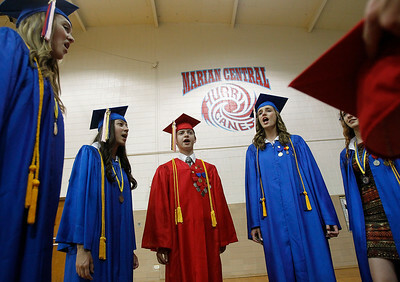 Matthew Apgar - mapgar@shawmedia.com Senior choir members (from left:) Erin McCoy, Gloria Kranenburg, Michael Morphew, Shea Pivnicka, Cristina Tompkins, and Connor Hull practice singing the national anthem in the spare gym prior to their commencement ceremony on Friday, May 29, 2015 at Marian Central Catholic High School in Woodstock. 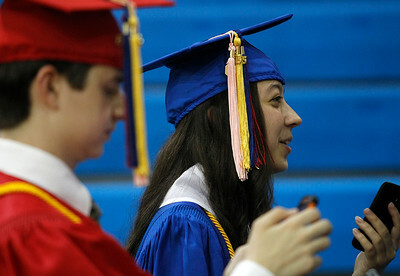 Matthew Apgar - mapgar@shawmedia.com Michael Morphew, left, checks his phone as Gloria Kranenburg, both 18 and from Woodstock, laughs with friends after making a call on her phone prior to their commencement ceremony on Friday, May 29, 2015 at Marian Central Catholic High School in Woodstock. Matthew Apgar - mapgar@shawmedia.com Graduating seniors K.J. 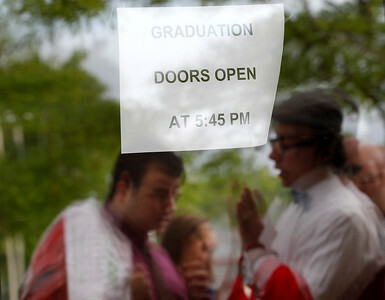 Gaffney of Harvard, left, and Tyler Birkhoff of McHenry, both 18, are reflected in the school's locked doors as they and others await the commencement ceremony on Friday, May 29, 2015 at Marian Central Catholic High School in Woodstock. 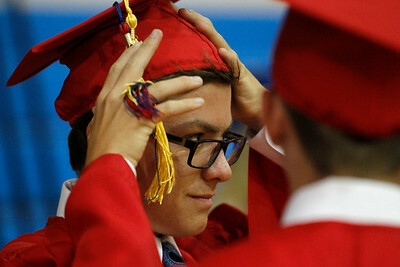 Matthew Apgar - mapgar@shawmedia.com Connor Orabutt, back, fixes his cap with the help of his brother, Ryan Orabutt, front, both 18 and from Algonquin, before their commencement ceremony on Friday, May 29, 2015 at Marian Central Catholic High School in Woodstock. 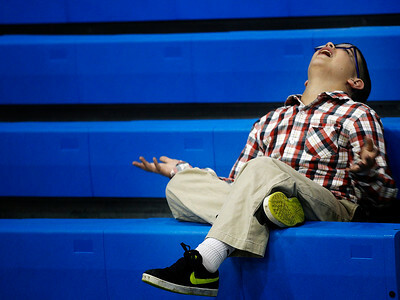 Gavin Digangi, 9, entertains himself in the bleachers as his sister, Delayne Digangi, 18, both of Crystal Lake, has her photo taken with numerous friends before their commencement ceremony on Friday, May 29, 2015 at Marian Central Catholic High School in Woodstock.